Featuring a beautiful hand-crafted wooden urn made out of beautiful Caribbean Rosewood with attention to detail in every aspect. Please notice the dovetail joints. 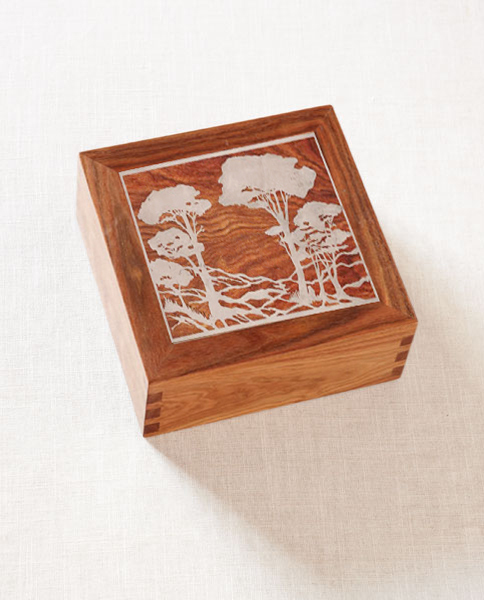 Featuring an inlaid scene of trees etched into the wood and inlaid with a silver/nickel alloy. It is then protected with a hand-rubbed wax for an exquisite finish. This is a unique and decorative art memorial that you would feel happy to show anywhere in your home. Note: These are not Cheap Chinese knock-offs. Each is professionally crafted in the U.S.